Creating characters to populate your novel or screenplay is a lot of fun. You get to devise different backgrounds and opinions and alliances and secrets and all kinds of interesting stuff that brings the cast to life. But you can have the most detailed character sketches and richly drawn cast ever, and your story could still fall flat. How? It all comes down to how your characters react. A couple months ago I wrote a post about how characters interact with each other (Character Development: The Interaction Chart). Today I’m focusing on how characters react to story events. This is especially relevant with ensemble casts who are together as a pair or group for much of the plot, common in such genres as horror, buddy comedies and heists. I’ve created two types of Reaction Charts: General Emotions and Plot Points. The point of making this chart is to ensure the characters don’t react the same. I was reading a book a couple weeks ago, a creepy horror that started off pretty good, but as the story went along I became bored. Why? Because even though the characters had different POVs and personalities, every time they faced the monster, they all reacted exactly the same way! Why have three characters if they’re all going to do the same thing? In my opinion, the fun of an ensemble horror is seeing how each character reacts, who is going to screw up, who is going to fight the monster, who is going to run from the monster, etc. If everyone reacts the same, you might as well just have one person encountering the monster (or going on the road trip, or robbing the bank, etc), and that simply isn’t as interesting. 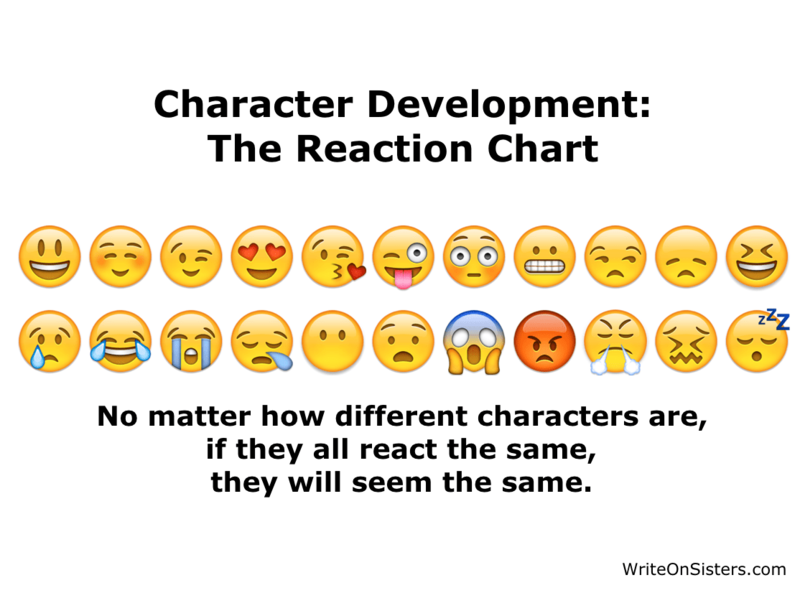 The point of making this chart, besides to diversify your characters’ specific reactions to the plot, is to track how the characters’ reactions change as the story progresses. For example, a character who reacted by rushing into danger at the beginning might learn to hold back and plan first before confronting the enemy. We all know our characters should grow and change, but sometimes it’s hard to see how that is happening within 300+ pages. That’s why I find this chart so useful. What about you? Do you chart your characters’ reactions? Or do you have another way to keep track? Let me know in the Comments! This is a great way to make certain the story moves along but doesn’t push the characters off the mountain. What a great idea, Heather!! I never thought of this. Thanks for the tip! You’re welcome, Colleen! Thanks for the comment! Tracking character consistency – that’s a good point! Thanks for the comment, Sara!